After a long time of procrastination (a year or two) I’ll finally publish a few blog posts about the mismatch between new emerging culture and the established cultural institutions in Finland. During the past 15 years (ever since katastro.fi did its first projects in Kiasma in 1998) I’ve been helping various grassroot projects to gain visibility and access to resources such as public funding. This has often been a paradoxical task, since most of the new, independent cultural projects have an uneasy relationship towards money, power and institutions. Some prominent examples of new Finnish culture include Ravintolapäivä / Restaurant Day, Siivouspäivä / Cleaning Day, Kallio-liike, Open Knowledge Finland and Avoin ministeriä / Open Ministry. What is peculiar about this new wave of cultural organisations is that many of them don’t necessarily want to be labeled as culture at all. Or if the label ‘culture’ is accepted, the attitude towards institutions (and institutionalization) is more or less averse. During the past decades, various national cultural institutions were set up. These institutions defend the rights of individual cultural workers and organisations, document & archive the work, engage in developing education & research, lobby for funding and coordinate national & international promotion. Opposed to this, the current trend is to base the activities around informal social networks which are not hindered by annoying bureaucracy. With this approach one can make amazing things happen with very little resources. The obvious downside is that the resources are indeed very sparse – compromises might have to be made and continuity of the activities is uncertain. For many projects this is not a problem – people are happy to move on and start doing other things when the project runs out of steam. There was recently a good discussion about this on the FB-wall of Timo Santala (in Finnish). Projects based on volunteering can run fine as long as their scale remains relatively small. Problems easily arise if a project suddenly become successful. One day you might be in a situation where your activities reach thousands of people, you receive invitations to various important national and international events, you spend a lot of time in interviews & preparing material for the media, you get invited to participate in various expert committees and working groups, etc. And in addition you of course need to keep the actual project going. And no one is willing to pay you anything for all of this, which makes it very difficult to handle the situation. Which in turn is frustrating, since the thing that you have set up with a lot of love, care and effort is gaining momentum and not following along would seem like a big loss. So, what are the options in this situation? In general there are three different paths one can follow, and in my opinion none of these options is ‘right one’ or ‘better’ than others. And often one needs to use all of these 3 approaches simultaneously. With careful planning and cool head you can keep your activities to basic minimum, and keep them running on volunteer basis, the same way as before. You might not be able to follow up on many opportunities, but such is life. You can try to find a way to commercialise the project or some aspects of it. For some projects this can happen naturally, for some this might be difficult – in order to make money, you would change some crucially important aspects of it. The project might become a thriving business, but it would essentially morph into a different project. You might try to get public cultural funding bodies to recognise the significance of your activities and grant you support so that you can continue to develop your activities. My work has mostly focused on option 3 and this is because I have an ‘old school’ view on what culture is, or what it should be. I believe that it makes sense for the society to invest some of its resources to support the sustainability and development of culture, in the same way as we invest in research and education. This ‘traditional’ approach to culture has been out of fashion for a while already, but maybe the tide is turning – there are at least some signs of it in the UK (see articles in The Guardian & The Atlantic). Perhaps one reason for the unpopularity of the public funding system is that it has some fundamental flaws which have made it virtually impossible for new players to get into the funding loop. All the funding for cultural organisations is already earmarked for existing established organisations and the system has been designed to maintain this status quo. This situation should be changed and it could be done by quite simple means. More about this in the following postings! On the other hand, I think that new culture could learn something from the old established institutions. Or if not, then we should gain a better understanding of this new culture based on volunteering, meritocracy, precarious & fluid organisations, etc. Ok, that’s enough for an introduction! PART 2: How to Improve Peer Evaluation? 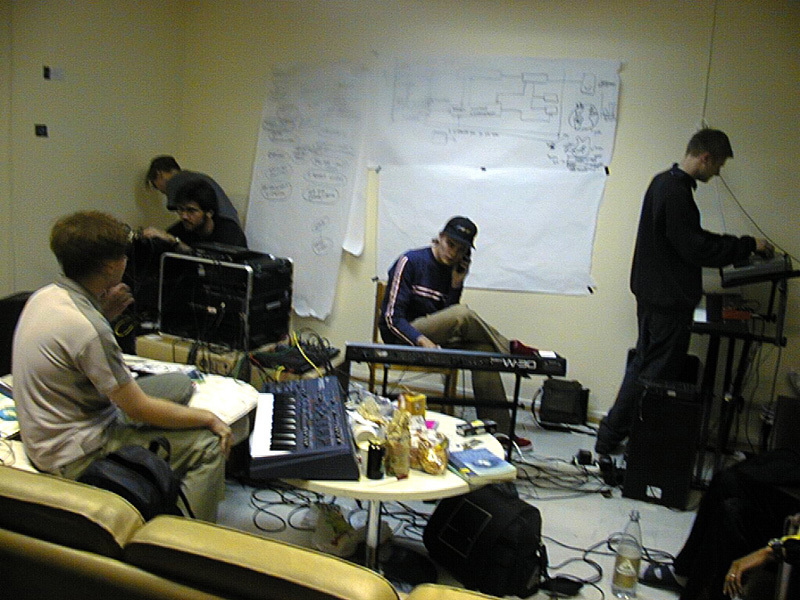 Juha, funny you should post that katastro.fi office photo just now — it’s from brothomstates’ band rehearsal just before a gig in Saunabar, 28th July 1999. I just happened to find a DAT recording of the gig a couple of days ago. How to improve peer evaluation?